The damage count from Hurricane Riley? One fish, one fish bowl, one Martha Stewart Glass, one glass picture frame, one lamp shade. My version of payback? 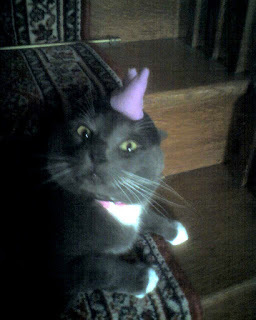 Riley's Halloween hat of purple horns. Doesn't he look happy? Just call him "LuciFUR" from now on. He looks like he's about to lash out furiously. I think it is appropriate given the amount of wreckage he's created recently.